There was a large Government contingent joining Prime Minister Jacinda Ardern at the official re-opening of Potline 4 at New Zealand Aluminium Smelter’s (NZAS) Tiwai Point smelter at Bluff yesterday. The climate change-obsessed PM made a big issue of the fact the expanded aluminium smelting capacity would help the low-carbon transition to a low emissions future, when in fact there was hardly a change being made at the smelter, but rather a reopening of expanded capacity because of market conditions. The media site Stuff reported that yesterday marked the official re-opening of NZAS’s Potline 4, which had been closed for six years amid historically low aluminium prices and higher energy costs. Stuff said improved market conditions and a new contract with Meridian Energy led majority owner Rio Tinto to reopen it the potline. Ardern claimed in her speech that opportunities as well as challenges arose from climate change and she called for combined effort to find and seize opportunities amid the demand for more sustainable low-carbon products. At the opening NZAS chief executive Stew Hamilton said the smelter would undergo the “rigorous” Aluminium Stewardship Initiative certification process. This was a multi-stakeholder, non-profit standards-setting organisation working towards responsible production, sourcing and stewardship of aluminium. Rio Tinto Pacific operations chief Kellie Parker told the gathering that restarting the potline would increase the smelter's production capacity by around 10% and, with increased orders for other products, had created 45 jobs. The smelter's product was used in smartphones, electronics, lighter and more energy-efficient cars - even down to a recently announced deal making Nespresso coffee pods “from responsibly-sourced aluminium” something Rio Tinto’s aluminium smelting empire has been promoting. 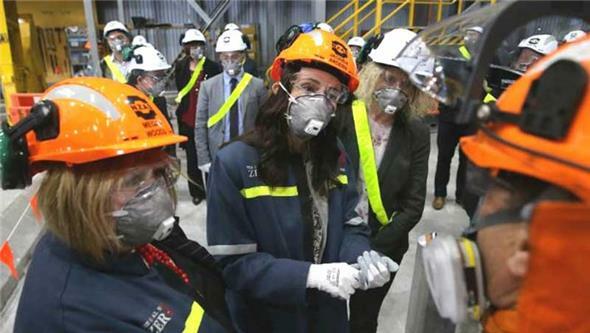 Jacinda Ardern acknowledged that of the smelter's $1.3 billion export earnings about 3% was to the United States. One of the positives from yesterday’s ceremony was that it dissipates the earlier problem for NZAS and the Rio Tinto Pacific Alumina group operations in Australasia about this group of smelters being on the sale or chopping block. 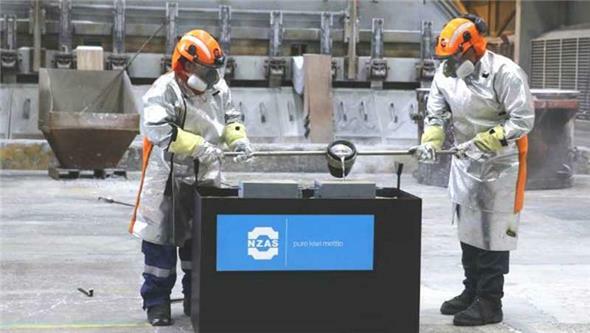 NZAS staff pouring an aluminium cast to make a commemorative gift for PM Jacinda Ardern from Potline 4. Photo: Robyn Edie, Stuff. A muffled conversation from Energy Minister Megan Woods (left), Prime Minister Jacinda Ardern and Labour List MP Liz Craig at the Potline 4 opening. Photo Robyn Edie, Stuff.